Sorry Alex didn't win this battle. I leave my nest boxes in all year round. I do not have any issues when breeding season comes around. I also find in summer, some of my birds like to sit inside them during the heat of the day even though I have a spray system set up to help keep them cool. Topic: My new hen. Excited! Re: My new hen. Excited! Thanks, dukaring. I think she is gorgeous to. 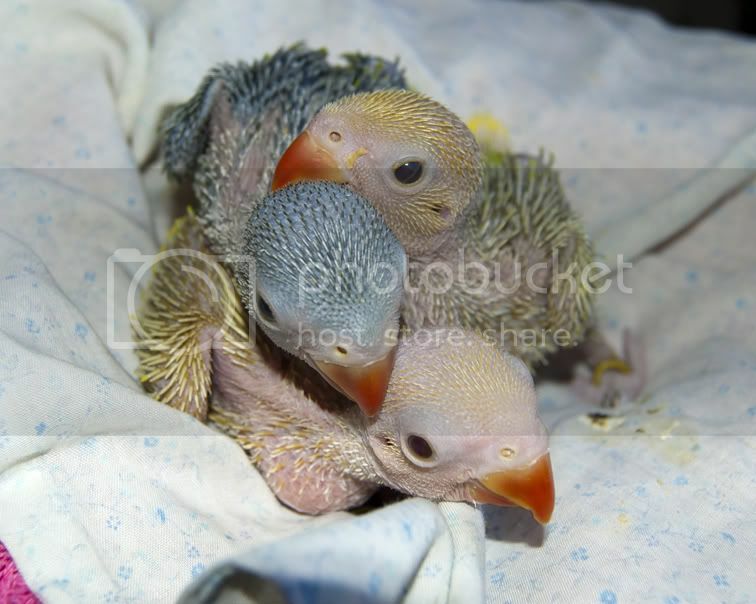 2 chicks hatched but I found them on the bottom of the aviary, they were both attacked and only 1 and 2 days old. Did yours end up hatching, SCB22? hahaha, reminds me of a cape! 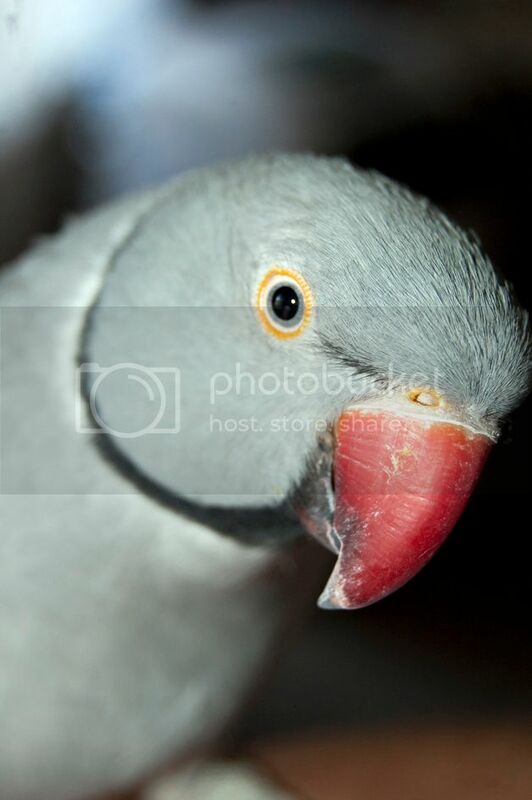 I also have a African Grey, his name is Rafiki and out smarts me more often than I care to say. lol Sometimes they are just too smart for their own good. Nice collection of birds you have. 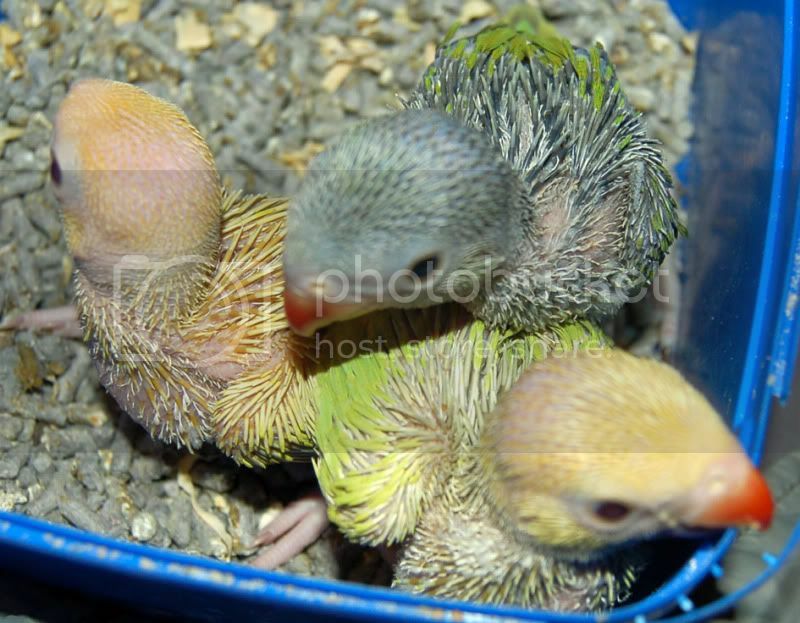 A few I have in my flock are:- IRNs, cockatiels, Rainbow Lorikeets and Sun Conures. A nice collection of colours you have. My new girl has 4 eggs already. Not sure if fertile yet as she is being the over protective mumma at the moment, so I won't disturb her and let her do her own thing. lol Birds can be very clever at mimicking, especially electronic things. I have been caught out numerous times of the phone 'ringing'. Redzone, I have not noticed either of the birds mimicing each other as yet, but it wouldn't surprise me if either of them do eventually. I've been trying to get a photo of them at bed time sleeping next to each other but everytime I go near their cage, they wake up and move lol. Sad to hear stories like Frankie, but heart warming to read people DO care enough to rescue and make a better life for them. Welcome to the forum, Ziggy. Hope your new mate learns to trust again, good luck. Your place sounds wonderful and so do your birds. Seems once you get the feather bug, it never leaves you, huh? Thanks Ellie. I have a blue/pallid for her. Possibilities of some pretty bubs. Thanks Ring0neck and hope you have a great season as well. I took these pics about an hour ago. Rascal and Chi are still quite bonded at this stage. Rascal and Chi after their version of a bath. This pic was taken end April this year. I will have to take a few more soon. Don't want them thinking they are no longer photogenic! They are approximately 9 months old now. Do I hear cockatiels in the background? Love the bird stand/perch, so natural looking with lots of branches. Did you upload the pic to a photo host then copy and paste the link? awww, that is such a nice photo. The videos were so sweet and pics are great. It is amazing how fast they grow even on a daily basis can see a difference. Really seems to be enjoying himself. It's funny watching them bathe. Mine get right into it when I am vacuuming or when I give them fresh water. Guess they don't like bathing in food tainted water. Topic: My grey IRN Sputnik showing how clever he is. Re: My grey IRN Sputnik showing how clever he is. Soildisetried wrote: I apologise, but, in my opinion, you are not right. I suggest it to discuss. My grey IRN Sputnik showing how clever he is. Sputnik is my baby I bred and handraised 3yrs ago. He has learnt everything from watching me with my African Grey, Rafiki. Such a clever boy! Oh those comments always make my blood boil! Good to hear Rookie is on the mend and you finally found out what the problem is. So hard to diagnose illness or problem with animals since they can't speak our language. Shame about naughty Sky. I have a hen who took a hatred to a few boys I put with her but eventually 'Muzza' wooed her over lol. Topic: New pics of my fids. 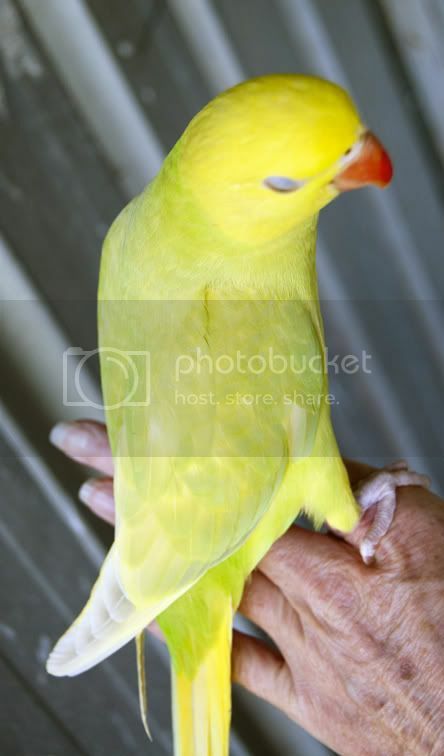 Re: New pics of my fids. Another one of my babies I raised, now around 3 years old. Very sweet. I love how each bird has their own personality, such funny characters. These are the cutest of pics. Looks very adorable. She sure is a quirky little character all right! I took this pic a couple of days ago as she was flying to me. Topic: My girl 'Lacey' playing with a toy ball. Re: My girl 'Lacey' playing with a toy ball. Lacey has always been a bit 'different' lol. She isn't afraid of much, everything in a new adventure just waiting for her lol. Plus she was raised with lots of toys so I guess she thinks everything is a game. haha, Benny looks like a chick compared to the Alex! I have been to Kiama....lovely area. Saw dolphins frolicking in the waves once....magical. Babies looked so cute. I loved the photo at the end of the bubs sitting on the spiral perch. Topic: guess what i got for my birthday? Re: guess what i got for my birthday? How is arrow settling into his new home? My girl 'Lacey' playing with a toy ball. You have a nice collection of birds.....and the dog seems to have the life as well. They look so relaxed just chilling and admiring the view. How did you go with the voting? I like the bath photos and the play gym is very cool. Lots of activities on there to keep a bird happy. Wow...beautiful pics of beautiful birds. Hard to choose a favourite. Topic: Are both chicks pallidino? 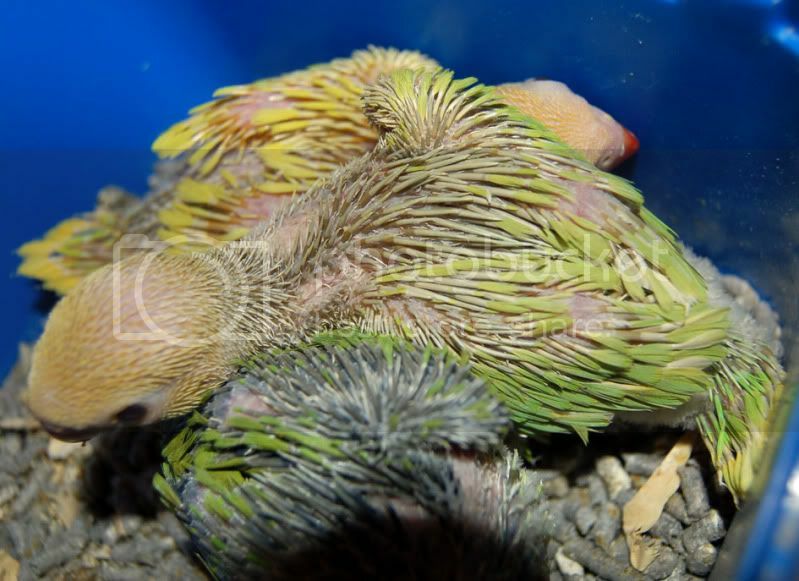 Re: Are both chicks pallidino? Great looking bunch you have their. Nice mix. Coco has the look of innocence with a glimmer of cheekiness to boot. evaleen wrote: they'v grown up nicely. mission mummy accomplished eh? congrats! Aprox 5-6 weeks of age. There is just over a weeks age difference between the first and last hatched chick. Congratulations and fingers crossed for a successful breeding season next time. Topic: Look what I found in the nest! Re: Look what I found in the nest! Look what I found in the nest! Hi nicola. Check out the breeding section of the forum, should be something there. What a sad way to have Bob come into your life. Sounds like he has found a good home though. Chicks are revealing more and more everyday. The lutino hen parents are meant to be straight lutino with no splits according to the breeder. The DNA certificate I got with the male says blue/pallid, if that helps any. mikeb wrote: if they are pallid wouldn't the eyes be red ? No problem and yes it worked. 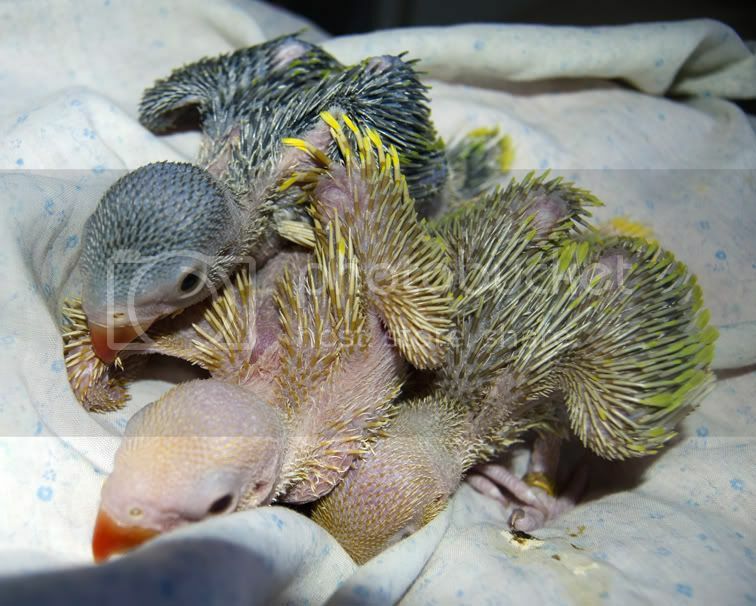 Is the male just grey and is the female yellow? Colours not showing up too well on my puter. Babies are now aprox 3 weeks old and getting very cheeky. Try uploading the photo to an image host like photobucket, (I use photobucket) imageshack etc, then copy the image code and paste in here. Providing a clear photo may help in getting a response. I will take a few more photos in the coming days when the feathers start to come out more. I am pretty excited as this is the first time I have had anything other than green, grey, blue and lutino. He has such a cheeky look about him, very sweet to. That coconut toy is great. I give mine coconut haves to play and chew with, might have to spruce it up by adding a bit of coloured toys. Hi Darkshowers. The fun part (and hard part) is choosing a name. I am hopeless to names. I think of something I think is cool or fitting then I end up calling him/her by the nickname and it eventually sticks. Hello all the way from Australia, Bubbles. 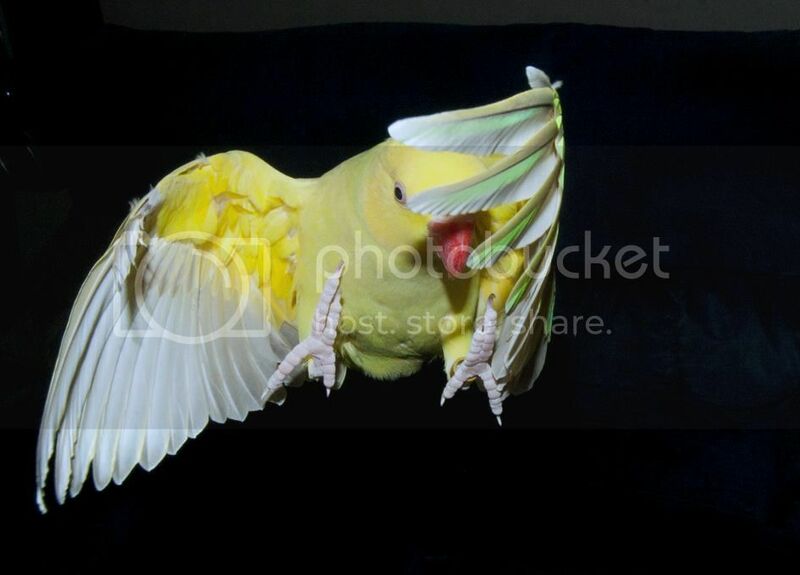 Had a giggle when I read one cockatiel says, 'I'm an eagle' How cute is that. Your ringies sound like they are making positive steps with you. Like you said, it's early days yet. Looking forward to hearing the process. Topic: Hi, I'm new to the site. Re: Hi, I'm new to the site. Chicken sounds gorgeous. I have a couple of greens as well, plus a few other colours hehe. Too many to choose from though. I love it when ringies fan out their tail like that. Hi Marco, welcome to the forum. Beautiful birds you have there and congrats on your eggs. Ah yes, ringies really LOVE their food, great bargaining power. Updated pics of the ringie bubs....taken out today for handraising, 17 & 14-15 days old. First feed went very well. I leave the nestboxes in & the pairs together all year round. I find sometimes in the middle of summer a couple of the ringies use the nests during the day, maybe to escape the heat? Welcome to the forum Amz & Rob. Awwww....Bundy would be so cute at that age. Do you know what colour Bundy will be or going to be a surprise? 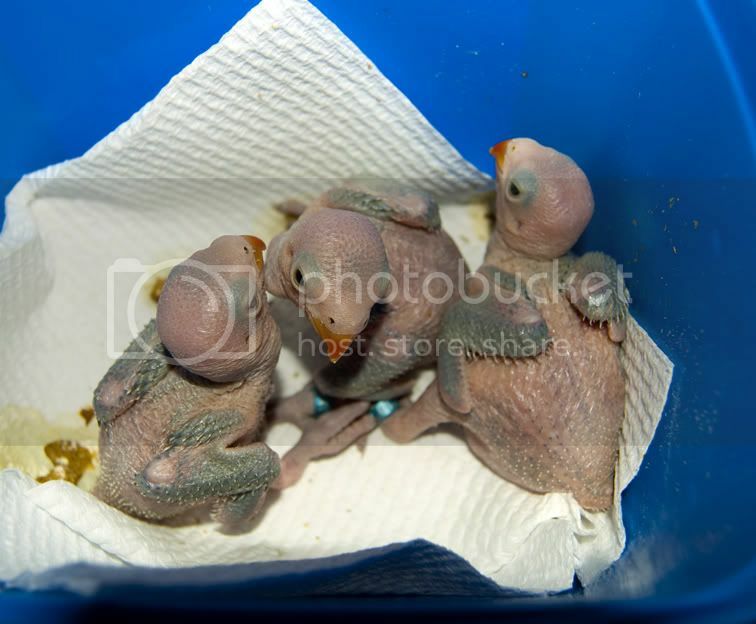 I have just had a few chicks hatch in the last week. Can't wait to handraise, love it. You are right, there is not alot of info out there for ringneck owners and alot of what is out there, is quite negative about these fantastic birds. I love the name Bam Bam, very cute. Such a shame when a gorgeous bird is classed as a pest....just doesn't seem fair although I can understand competition for native animals food, nests etc if a bird does escape, but still sad. Topic: New pictures of P.J. Re: New pictures of P.J. She looks so glad to have her mummy back home, especially in the third pic...priceless. I feel so sorry for birds when they are moulting, must be so uncomfortable to go through. Topic: Turkey, how did you get up there? Re: Turkey, how did you get up there? Ahhhh....pets!! They get themselves into the most silliest of places at times. Very nice, I like the second photo. Looks so cute with the head tilted like that. Very cute alexandrine you have there. What sweeties you have there. Omg, these photos are absolutely gorgeous. LOVE LOVE LOVE the pic where the gcc is snuggling into the ringie.....fantastic. Still a few more hens on eggs yet so hoping for a few bubbies this year. I even have one first timer hen (sister to the mum of these bubs) who has no partner yet she has laid eggs. First IRN babies have hatched for 2011! How is your little one doing? What did you end up naming him? Sounds like he may need vet attention. I am wondering if the bird is lacking in calcium? A avian vet would be able to help you better. Topic: Anyone else from Maryland? Re: Anyone else from Maryland? I am in Australia, but welcome to the forum. Hey Carla, welcome to the forum. Topic: dISH, Spoon and Zoey say hello from Gold Coast Aus. Re: dISH, Spoon and Zoey say hello from Gold Coast Aus. Did you end up finding out what may (if any) have been the cause of the toe in mouth thing? Hi Azmat and congrats on your new bird. What colour is she/he? Hello Keith. Nice collection of birds you have. Plumheads are beautiful birds. Never seen one in the flesh only in bird books and they look stunning. Check out the 'behaviour and training' section of the forum. You might find answers there. Hi haider.kk, welcome to the forum. Beautiful boy you have there. How old and how long have you had Alex? Mine make a noise late in the afternoon and sometimes early in the morning. Hiya Nadie, welcome to the bird nut clan. I used to live in Qld (so miss that place) and hope to move back in the not too distant future. Sounds like you have a nice little collection of ringies. hahaha I know the feeling of finding an 'excuse' to go wandering out back to check on my birds. Topic: Update from my end. Nice. The purple background seems to enhance the colour even more. Your Peanut is the same colour as my Jasper. I handraised Jasper from around 3 weeks old. She is now in the aviary with her man but very much still tame. She is currently laying eggs and has 2 in the nest atm. I hope they hatch for her this time. I love your Cody to. I agree, she is very beautiful, even if she is 'just a green' bird, I still think she is gorgeous. I can see why you fell in love with Zuko, beautiful. Awww....still little babies, lots of fun times ahead. What did you name your new bub? Hi Gem, welcome to the forum. Welcome to the forum Mr_liaison. 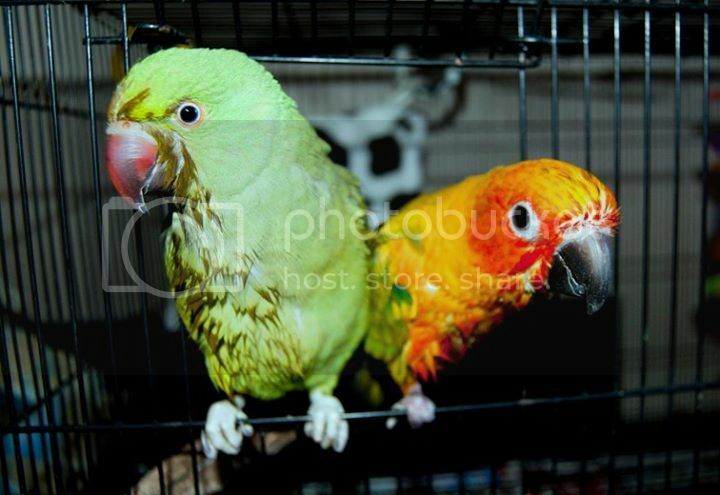 From reptiles to parrots....haha different. 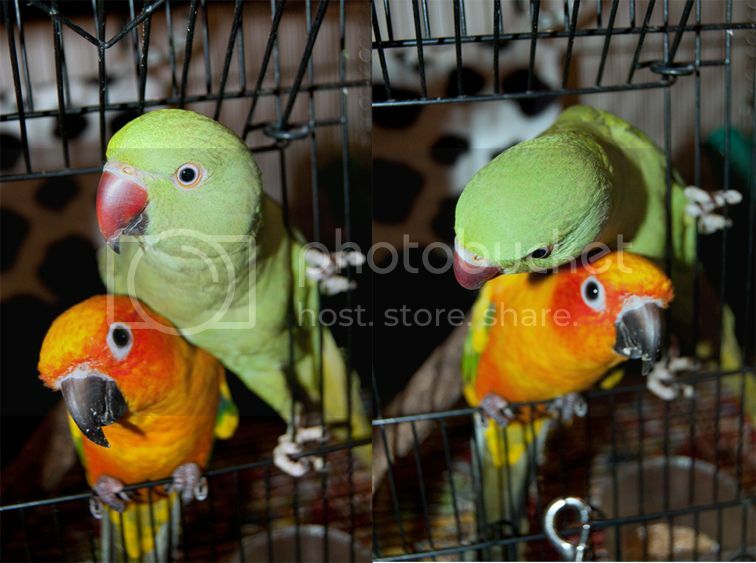 My partner used to keep reptiles and I have been into birds. Good luck with getting your new obsession off the ground. The only thing I can think of is to provide your bird with fruit and vegies to help him have nice and healthy feathers. Not sure if you can quicken the process any though, just let nature take its course I guess. Surrounded by animals....what a perfect picture. Welcome to the forum and to all your birdies to. Very cute little bird Welcome Echo. How is Mango doing now? Great pics of a very happy bird. I wipe my babies down constantly with a damp cloth when feeding while the formula is still moist. Hard to remove dried food. They are so cute at that age. Lovely looking babies. haha I love the males fancy dance they have to try and woo the girls. Maybe he needs to try just a bit harder to impress his lady friend. Thanks ring neck. The blue bub found a new home while the grey one is still with me, talks now. I have seen shred-able toys for sale that have paddle pop sticks in them for foraging. Just talk to her and say a simple word everytime like hello for example. The first word takes the longest. I had a couple of birds who I did not even try to teach to talk, they just copied what I was saying to them on a daily basis or what I said to my other birds. The longest I have been away would have been a week. My birds seemed to be ok with me when I got back. I agree with Azure. Females can make good talkers and I have found some are very quick to learn tricks. I hate moulting time, must be soooo uncomfortable for them. I notice when mine are going through a moult, they seem to bath more. Growing into a beautiful little man to. Hi kiwi, how is your baby doing? Babies are so cute, especially at that age. Sounds very sweet. How did you go with your birds feather loss problem? Did you end up taking her to a vet? If the bird is 10 yrs old as stated, then I am fairly certain Q-Bird is a definite girl. Why would the vet be leaning towards a male? Have they surgically or DNA sexed Q-Bird? That face in the second last photo shows lots of character. Welcome to the site to! Both your birds look beautiful. Fingers crossed they have bubs for you. What colour is your female ringie? Topic: Hello and advice welcome! Re: Hello and advice welcome! Welcome to the forum and congrats on getting your baby boy. Love the photos and your green boy looks very happy and healthy. Welcome lruiz. Congrats on your baby. How are the feedings going? Bet s/he has grown a bit since this post. Nice variety of birds you keep. 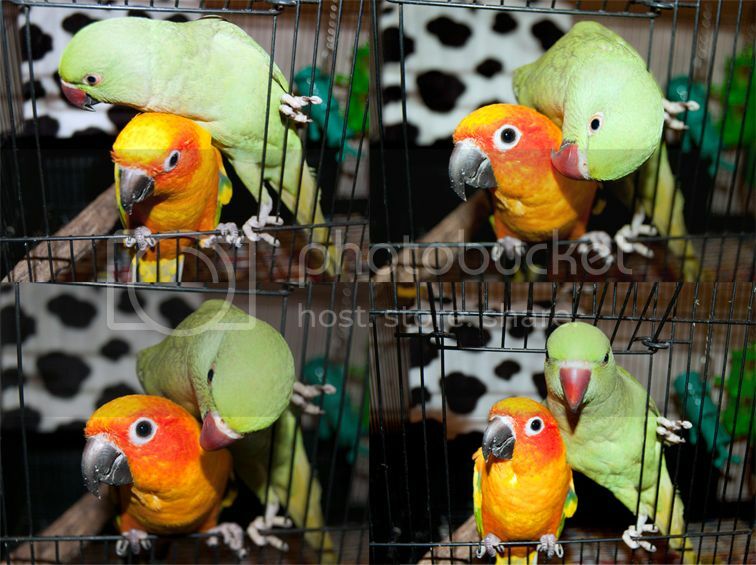 I am partial to lovebirds although do not have any at the moment. Nice looking ringie you have there, really enjoying the corn. What a sad start to your birds life. At least now there is a chance for a bit of happiness. Congrats on your baby, shame the age was a bit off......lucky for Skyler s/he went home with someone who was able to continue feeding formula and handraise. Khalid, the photos are not showing up for me. I do not trim my birds nails. I find they keep them down naturally when using nice sized natural perches. As for bathing, my birds also like to bath. They have a nice large bowl they hop into and have a splash around. Hi Max Rose, does your bird look like the blue pallid (lacewing) on this site? Scroll aprox half way down the page and you will see it. Welcome to the ringneck 'family', adreane. Sounds like Turkey has found a wonderful home. Have fun with 'her'. Topic: new to ringneck breeding. Re: new to ringneck breeding. Hi Javier, nice colours you will have there. Welcome to the forum, Mahdy. I have also trained a couple of my birds to do a few things. Great way to interact with them. I have 2 albino (blueino) ringies that my birds bred last year. Love the white ones. Welcome to the forum. Very sweet little one you have there. Topic: What happens after 4 years?? Re: What happens after 4 years?? Hi Jay, welcome to the forum and congrats on your new bub ringie. Maybe the tv is what started it! You haven't been letting them watch norty movies, have you!???? Congrats on your ringie. Check out behaviour and taming section as well as miscellaneous comments/questions, You may find some helpful info there to guide you.